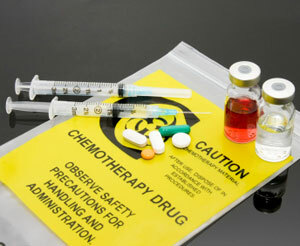 According to a publication written by Douglas Hanahan from the Swiss Institute for Experimental Cancer Research and the UCSF Department of Biochemistry and Biophysics and Robert A. Weinberg from the Whitehead Institute for Biomedical Research, there are six biological capabilities acquired during the development of human tumors that are defined as the hallmarks of cancer. 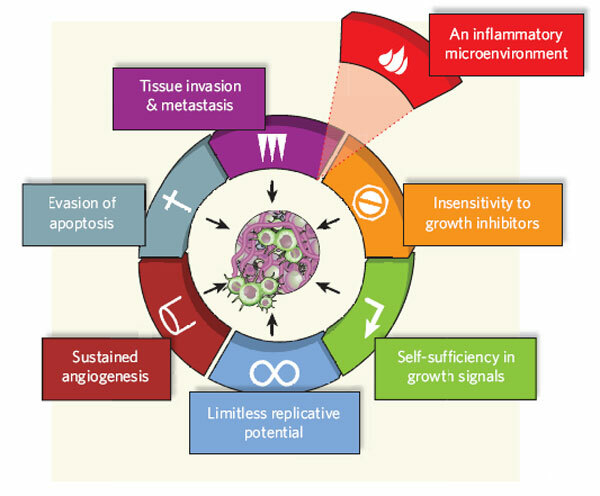 The six hallmarks include sustaining proliferative signaling, evading growth suppressors, resisting cell death, enabling replicative immortality, inducing angiogenesis, and activating invasion and metastasis. That may all sounds complex and confusing but over the course of this post, I will explain each of the hallmarks individually in a simple to understand fashion. One of the most fundamental traits of cancer is the ability for cancer cells to grow and duplicate constantly. When cells grow and duplicate, it is referred to as proliferation. Normal tissue cells control and regulate the production of signals that promote proliferation in cells, therefore maintaining a balance of cell number and function. Cancer cells, on the other hand, do not regulate these proliferation signals and they sustain proliferative signaling causing cancers to grow uncontrollably. In addition to normal tissue regulating the signals that promote proliferation, normal tissue also use growth suppressors to inhibit cell growth. Cancer cells have been able to evade these growth suppressors, also allowing them to grow uncontrollably. In human cells, there are dozens of growth suppressors that operate in a number of ways to limit cell proliferation. It has been discovered that in animal and human cancers, these growth suppressors are nearly always inactivated. In addition to growing uncontrollably, cancers also resist cell death or apoptosis. In normal cells, “contact inhibition”, a mechanism that promotes cell death when the population of normal cells becomes too dense, regulates cell numbers. Cancer cells lose this “contact inhibition” and can grow indefinitely to form tumors. Also, apoptosis or cell death serves as a natural barrier to cancer development in normal cells. 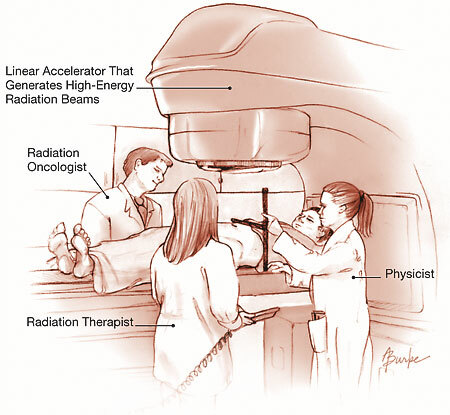 Cancer cells avoid apoptosis; as a result, tumors are able to grow indefinitely. Normal cells can only replicate a limited number of times before being unable to replicate anymore. Cancer cells require unlimited replicative potential in order to generate macroscopic (visible to the human eye) tumors. As a result, cancer cells come up with a number of mechanisms for enabling replicative immortality. Like normal tissue, cancerous tissue requires nutrients and oxygen as well as a way to get rid of wastes and carbon dioxide. Tumors address these needs through the induction of angiogenesis. Angiogenesis is the creation of blood vessels. Blood vessels to and through the cancerous tumors allow the tumors to receive the nutrients and oxygen they need and eliminate wastes and carbon dioxide. Lastly, cancers activate invasion and metastasis. Cancers begin in a localized area. 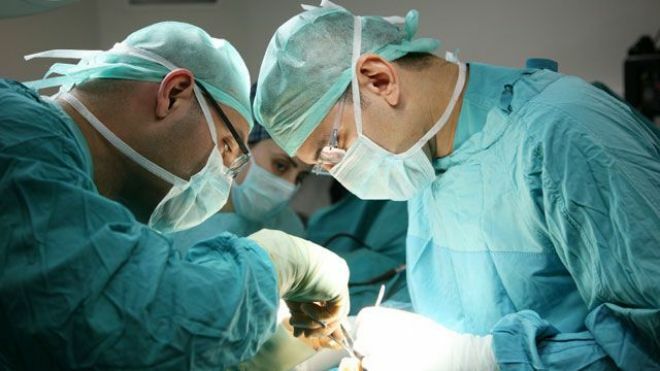 After growing to a respectable size, cancers will attempt to spread to other parts of the body by using the circulatory system and lymphatic system. Once the cancer spreads to other parts of the body, the cancer will attempt to grow in its new locations. The original publication can be found at http://www.ncbi.nlm.nih.gov/pubmed/21376230. Please be aware that this is a very scientific and difficult read.